Displaying a wide range of glassware all with a 30ml dram fill. Image courtesy of Dramnation. So there is no do’s & don’ts when it comes to a whisky glass. Not really anyway but there are some rules to apply to help guide you through. In time as your appreciation balloons, so too you will discover what is right for you. For myself over time I have collected a fair range of glasses for personal use and or collected as gifts from distillers. What I have always found is that I narrow back towards one particular glass. My personal favourite is the fluted stem glass otherwise know as a Copita. We shall get to why that is my personal favourite later on. 1. Do you like to hold your whisky to the light to look at the colour and viscosity (the legs that form around the sides of the glass)? 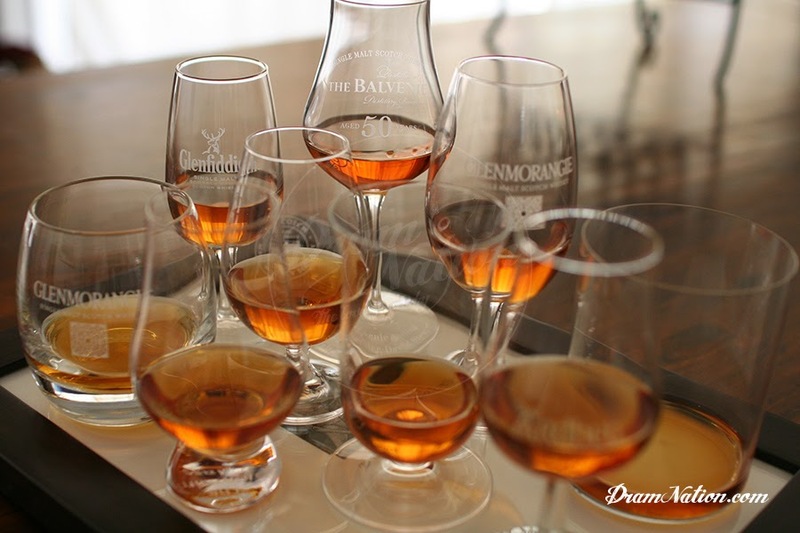 Eyeballing the glass contents is a beautiful experience and one most whisky appreciators do naturally. 2. You may also be refilling your glass many times in a sitting so keeping the glass clear of finger prints can be important also (return to item 1. eyeballing). Who likes a grubby glass filled with a 21yo you Glenfiddich? 3. When holding a glass heat will also transfer into the liquid from your warm fingers. Typically fine crystal and brandy balloons are specifically designed to do just that but not everyone likes warm whisky. 4. Neat, on the rocks, ice balls, icebergs, and whisky stones to name but a few, will also determine the durability, weight and mouth opening of a glass. It is embarrassing to pour a glass of whisky only to fined you can’t fit a whisky ball into the opening or the ice swarms up the edges and blocks the mouth at every sip. Wide mouths open the aromas and dissipate intense alcohol burn while a narrow mouth intensifies flavours and alcohol. These factors, regardless if you care for them or not, will pull you choices one way or the other. When you start attending whisky tastings (if your not already), watch how often others offer extensive experience manage the glassware as it can make for interesting viewing and education. The Ardbeg tulip copita, Glenmorangie stemmed copita, Riedel Whisky tumbler. Image courtesy of Dramnation. Nosing whisky is pretty obvious in what that means. 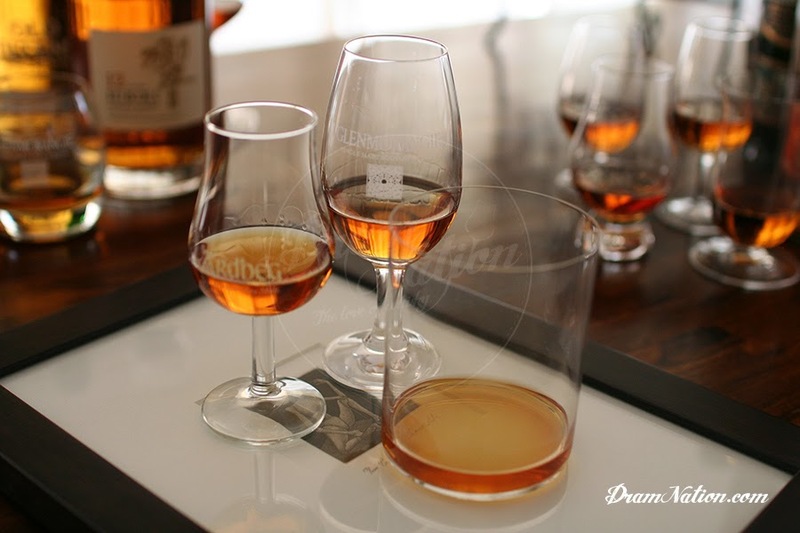 Bringing the glass to the nose, take in the vaporous aromas lifting off the whisky, and indulge the senses. Alcohol is a big factor in delivering the level of these aromas. By concentrating these aromas you will bring all the scents and notes typically recognised by that whisky into your system. A glass with a tapered mouth will deliver a concentration of these notes, while an open wide mouth allows the those notes to dissipate if they are too intense. Typically you will see Scotch whisky in served in a tapered mouth while a Bourbon whiskey is delivered in an open mouthed glass (don't take that as gospel though as it is just an observation). To get even more geeky, and even if you do not realise it yet, most people will have one nostril more sensitive than the other. Using a tapered mouthed glass can make it much easier to shift the scents to the favoured nostril. 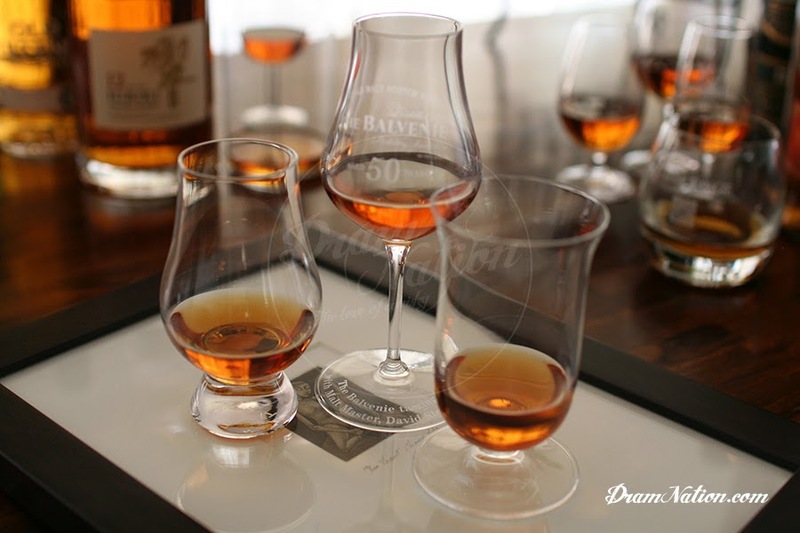 Many distillers release their own style of glasses so take note of this as it is clear indication what the master distiller is intending your experience to be. 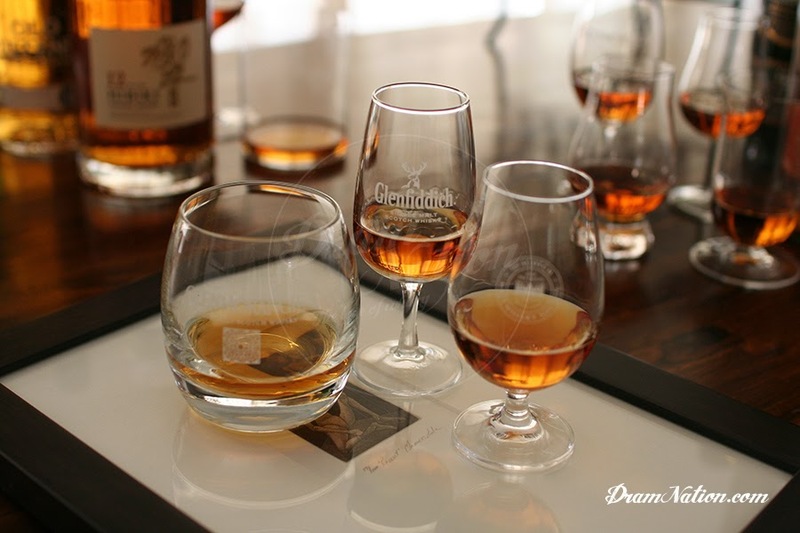 The Glencairn Whisky Glass, Riedel Cognac XO, Riedel Single Malt Whisky Thistle. Image courtesy of Dramnation. How you take your whisky can relate to the volume pored, is there ice or whisky stones, will water be added, or is the whisky taken neat. Consider volume first and what your pour naturally is. A 30ml dram/pour is typical and is easily recognisable as it generally fills to the centre bulb of a 120ml copita glass. 30ml in a tumbler barely breaks the bottom of the glass so you naturally fill the glass more, especially when adding ice. Ice or whisky stones will lean whisky to be served in a tumbler as noted in item 4. A large piece of ice is preferable to many smaller pieces as it does not melt off as quick. This in turn means a wider mouth to the glass to fit the ice cube. Whisky stones, as great an idea as they seem, do weigh a lot. Adding them to a stemmed copita will create the top heavy effect and the floor will be wearing your precious liquid at the slightest knock. Look towards the images displayed through out this article. Each glass holds exactly the same measure of 30ml liquid. This displays a visual consideration as some are full while others look almost empty. When you have a guest over and wish to pour them a precious dram of your much loved whisky, you certainly don’t want them feeling stiffed after being handed a near empty tumbler. Considering what you should use at these times also can have consequences. Glass vs crystal? Honestly that is your preference. Glass is durable while crystal can either be thick and heavy or fine and very breakable. This really comes down to a personal choice. Chances of lead leaching is not a factor though urban myths fable that you will slowly poison yourself. The Glenmorangie Tumbler, Classic 120ml Stemmed Copita, SMWS Society Glass. Image courtesy of Dramnation. Without getting into lectures about what glass is better I’ll describe just what my natural selection is for a whisky glass. My personal choice is a 120ml stemmed copita glass with a tapered mouth. This style delivers a full looking glass with a 30ml measure, concentrates the aromas, stops heat transfer and grubby marks, and displays the whisky in the best light. If the situation requires more stability or I am walking around at a garden party then a more stubby based copita such as a Glencairn Whisky Glass will work fine. As much as crystal feels nice I avoid its use because I just break them too often. Crystal gets expensive. Spot the branded Glenfiddich glass amongst the images as this is my ideal all rounder whisky glass. Overall I have a glass for almost every situation but the reality is 95% of the time I reach for just one. On a special occasion I go for the Riedel Cognac XO stemmed copita. In time you will find what is right for you and I am sure you will also build up a nice collection of glassware to share around. Fill your shelf with six of your favourite style as this will often be enough combined with a few special occasion glasses to see you through a few drams with mates. Note: This article was originally written by Matt Wooler for Dramnation and has appeared on Watch & Whisky.